It's time for a new STAMPlorations CUTplorations challenge!! The November inspiration photo is full of fall goodness. What will inspire you? The picture, the colors, the words?? Prizes: $15 GC for the winner (voted by the team); $5 GC to three (3) randomly picked players. For my card, I started by blending distress oxide ink using the Rag Rug Stencil for a background. 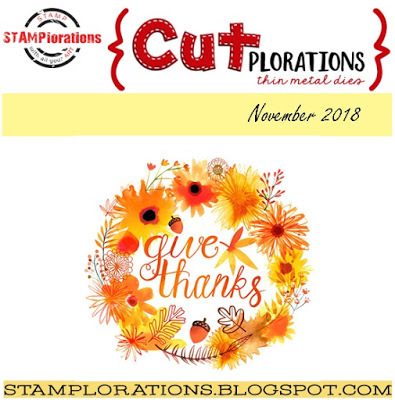 I then stamped and fussy cut the fabulous leaves from the Trendy Leaves stamp set. The word is CUTplorations Thankful word die. Beautiful card. Lovely wreath of leaves behind that great die cut. Also love the background you made with the stencil. Such an abundant wreath. Perfect for this season of gratitude.